Broken Spoke Bike Co-op | More from Team Beryl! In May 2015, Team Beryl re-established Beryl’s Night, a mini-class and open workshop on the first Thursday of every month, just for women and trans folk. Since then, we’ve welcomed over 100 people into the workshop just for Beryl’s Night – an average of 15 people every three-hour session! Sharing in the positivity and enthusiasm for learning displayed by Beryl’s Night participants makes our little hearts swell every time. Of course, the Broken Spoke bike workshop is a very inclusive space and all of our staff and volunteers strive to make sure everyone feels welcome here. But if there’s one thing we’ve learned from running Beryl’s Night, it’s that there is an enormous demand for woman-focused activities in the workshop. For months, we have been collectively scratching our heads about how we can provide more safe entry points for women to come to the workshop and get stuck into mechanics. We’ve finally hit on a very simple solution that has actually been under our noses the entire time. 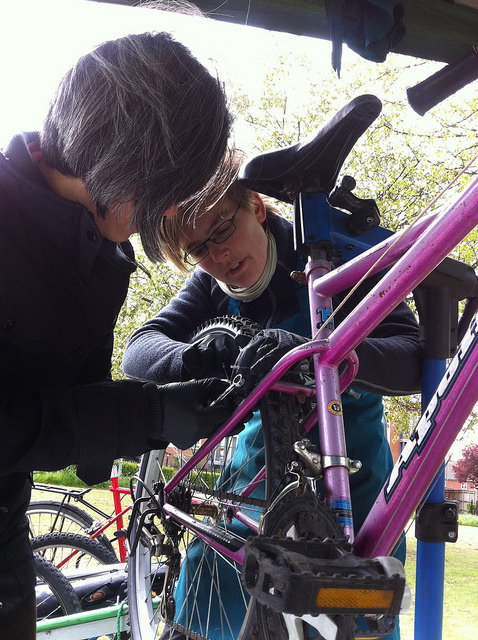 Every week, two of our drop-in open workshop sessions are run by the Broken Spoke’s amazing female lead mechanics, Meike and Elle. Until now, there has been no way for the general public to know when, exactly, they can expect to see either of these two in action. Team Beryl is pleased to announce that the same woman-led open workshop sessions that we’ve always offered will now be advertised as such! 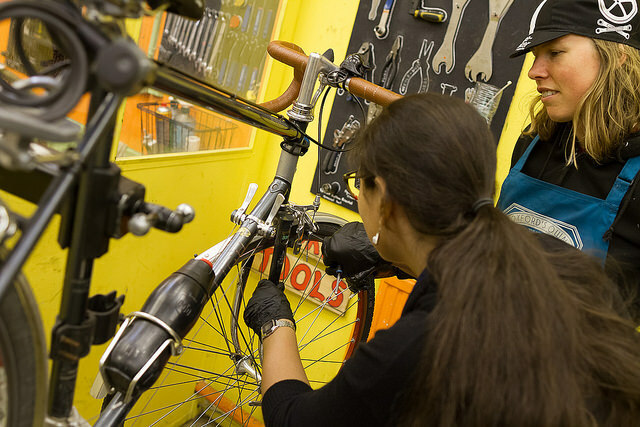 Every Friday from 11:00am until 5:00pm, alternate Saturdays from 2:00pm to 7:00pm, and alternate Sundays from 10:00am to 2:00pm, you can walk into the open workshop session and expect the workshop to be led by a female mechanic. As often as possible, these sessions will also be supported by volunteers from Team Beryl, so if you’re a Beryl’s Night regular, your chances of seeing someone you know are high. Check the calendar to find out when Meike or Elle is running the open workshop! Beryl’s Night takes place on the first Thursday of every month from 6:00 – 9:00pm. For information about the next Beryl’s Night, look at our webpage or join our Facebook group.